I’m in another black hole of knitting. Remember this picture of my Shadow Spiral Scarf I posted two days ago? Well, I been knitting for WEEKS since that post 2 days ago, and my scarf hasn’t gotten any longer. My yarn seems to be getting eaten up but every time I look at the scarf, it’s the same size. 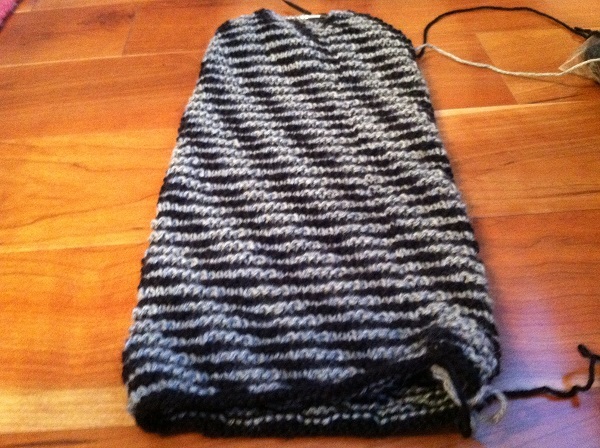 Here is part of the problem: The scarf is knit in the round, so it will be a double thick scarf. I also cast on 32 more stitches than the pattern calls for because I wanted it wider. 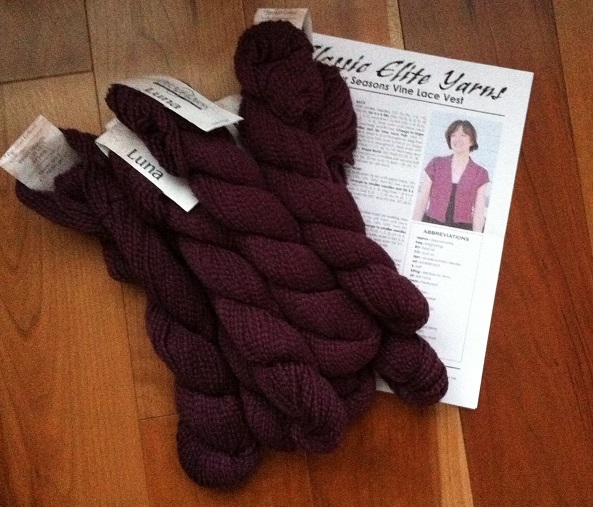 Plus, the pattern calls for the scarf to be 49″ long, but I like it longer, so I can wrap it around my neck. I have two skeins of each color, each skein being 220 yards (880 total yards). I’m just about done with the first skeins and the scarf measures about 30″. The pattern calls for 280 yards of each color (560 total yards). So, if I had knit this according to the pattern, I’d be almost done. Instead, I am halfway done. But, I love how it is turning out and I love, Love, LOVE the yarn (Aslan Trends Royal Alpaca; 100% Alpaca). Soon, I’m sure I will begin the “I think it’s probably long enough” chatter in my head, even though I won’t be done with the yarn and it won’t be as long as I originally planned. I will try very hard to ignore that chatter, and knit until the yarn is gone. Wish me luck. A cute spring/summer (although the pattern says “four season”) little number! “A poignant novel about loss, lies, and the unbreakable bonds of family. If you like these family drama books, I think you will really like this one. Now, to start Divergent which I’m very excited about! Posted in Uncategorized and tagged divergent, pack up the moon, rachael herron, shadow spiral scarf, veronica roth, vine lace vest on March 28, 2014 by lizytish. I am in such a huge reading mode right now. I think I will try this book.